and we've got it in stock. getting and explaining knife laws for all 50 states. includes the primary knife statutes for the state, word-for-word. ALSO COVERS FEDERAL KNIFE LAWS. It even includes selected court cases at the state level. Well organized, with extensive resources listed. Large format 8.5 x 11 inches; 200 pgs; only $24.95! This is it folks -- most gun-savvy people carry a knife. Some prefer a knife since it is easier to carry it legally. 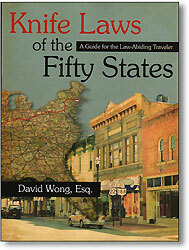 "Knife Laws of the 50 States" takes away the guesswork!